The Mexican striker Alan Pulido has become the latest acquisition of Greek team Olympiakos after his brief spell with their junior club Levadiakos. According to Record, Pulido will soon be joining the Greek reigning champions and will have the opportunity to play in the Champions League. “Olympiakos represent Greece all over the world, as well as in most international competitions. I am committed to work hard and will try to win the fans hearts as soon as possible! Vamos Olympiakos!” said the former Tigres UANL Player during the press conference. Pulido still needs to solve legal issues with Tigres. He emigrated to Europe as a free agent when he had a contract in place with the Mexican club. 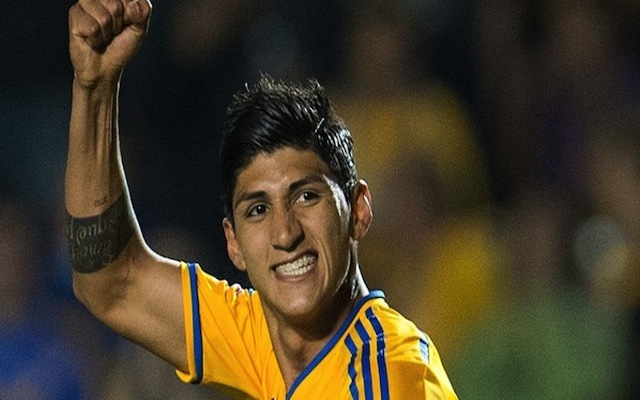 Tigres insist Pulido signed contract until June 2016 but the player argues his signature was forged. During the transfer window process last month Chivas bought 50 percent of Pulido’s rights from Tigres and they are also now awaiting for a resolution from the disciplinary committee, no doubt hoping Pulido has no other choice but to go back to Mexico.